See more objects with the tag artists, collectors, architecture, antiquity, borders, classical, branches, designers, columns, print collectors, ruins, garlands, leaves, upper middle-class, sprays. This is a Print. It was designed by François Boucher and etched by Claude-Augustin Duflos. It is dated 1740 and we acquired it in 1921. Its medium is etching and engraving on white laid paper. It is a part of the Drawings, Prints, and Graphic Design department. This design for a folding screen panel by François Boucher is an homage to the rustic and the rural. It was etched and engraved as part of a series of folding screen designs. 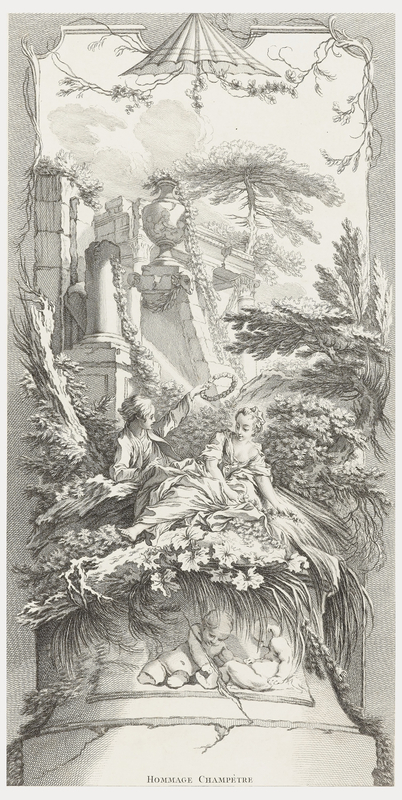 In Boucher’s design, a shepherd crowns a shepherdess with a floral wreath. The two figures rest on an oversized pedestal ornamented by two putti. In the recess are broken columns and ruined temples that serve as vanitas (mortality) motifs. There is a sense of rustic playfulness and the Italianate trees in the background presents the scene as a Georgic fantasy. The design is framed by scrolling vines and garlands topped with a pagoda motif. Indolent shepherdesses and picturesque ruins are themes that appear throughout Boucher’s prints and paintings. Here, Boucher has merged his artistic predilections in the service of ornament. While folding screens based on his designs were probably never realized, Boucher, along with artists such as Antoine Watteau, Claude Audran, Jacques de Lajoüe, and Nicolas Lancret, designed panels for folding screens, particularly as the latter became a ubiquitous part of French interior furnishings from the late seventeenth-century onwards. 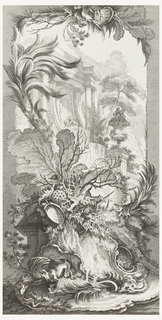 On plate, lower center, in the image: HOMMAGE CHAMPÈTRE; lower left: F. Boucher Pinxit; lower right: C.L. Duflos Sculp. ; lower center: A Paris chez De Larmessin, graveur du Roy rue des Noyers à la deuxieme Porte cochere à gauche entrant par la rue St. Jacques. A.P.D.R.